Whine, whine, whine...still sick. I had a relapse. I hope this is over before I get on the plane to go out to Stitches West! By the way, I will not be making a blog entry next week. I will be in Santa Clara at Stitches. 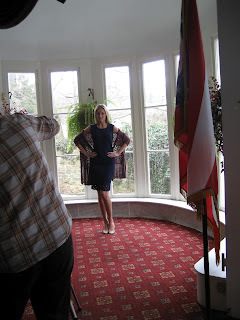 The photo shoot for the Summer issue of Cast On was at the Granville Inn in Granville, OH on the 15th. It was lots of fun. The Stitch Anatomy Lesson is on Double Knitting and the Fashion Framework lesson is on triangular shawls. Cast On is not seasonal unlike most knitting magazines but the shawls would make great summer projects. A shawl is a useful accessory thanks to air conditioning, particularly if you live in a warm climate! There are lots of lovely shawls in the issue including some that are quick knits. I was very pleased by the way my garments turned out. I took a few photos. Luckily Cast On's photographer is better than me! I didn't use a flash as I didn't want to screw up his photographs. The Granville Inn was a lovely location for the shoot. The staff was all very helpful considering how we took over the public areas. One advantage to the location is that the Inn is very close to Goumas Confections. Penny Sitler introduced me to their chocolates a few years ago. I never to go Granville without stopping by. It is long drive from Lexington to Granville but I know I will chocolate to help me on the way back! I promise, the photos will be better in the magazine which comes out in May! I received lots of lessons to review. Keep up the good work! For anyone planning on sending in lessons next week, I will leaving for Santa Clara first thing in the morning Thursday. If your lesson arrives while I'm gone I won't get to it until the following Tuesday. I decided to take a red eye back from California and I have a long layover in Salt Lake City which sounds crazy but I have a sister in SLC who I am hoping will come to the airport to fetch me. I don't get back until Monday morning. I try to review lessons the same day I get them but if I have 10 waiting for me that might not happen! Recently I've had several knitters ask me how to weave in yarn tails in ribbing. 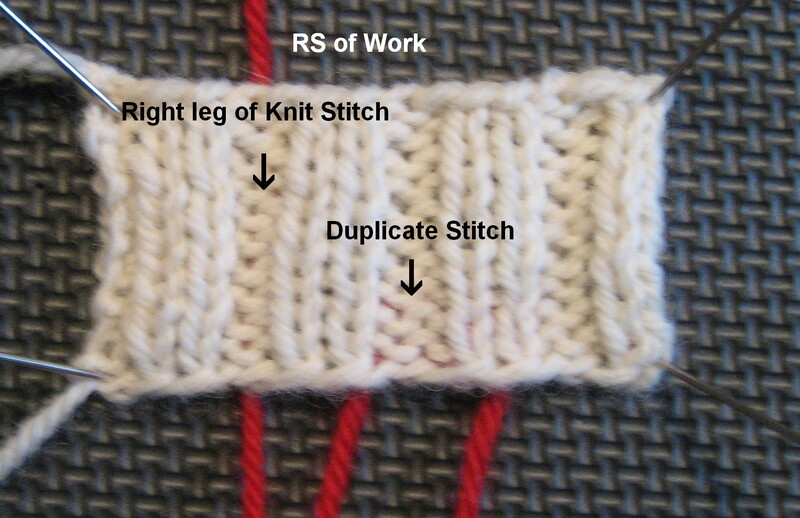 I did do a video several years ago about weaving in yarn tails but how to deal with ribbing is sort of embedded in the duplicate stitch information. 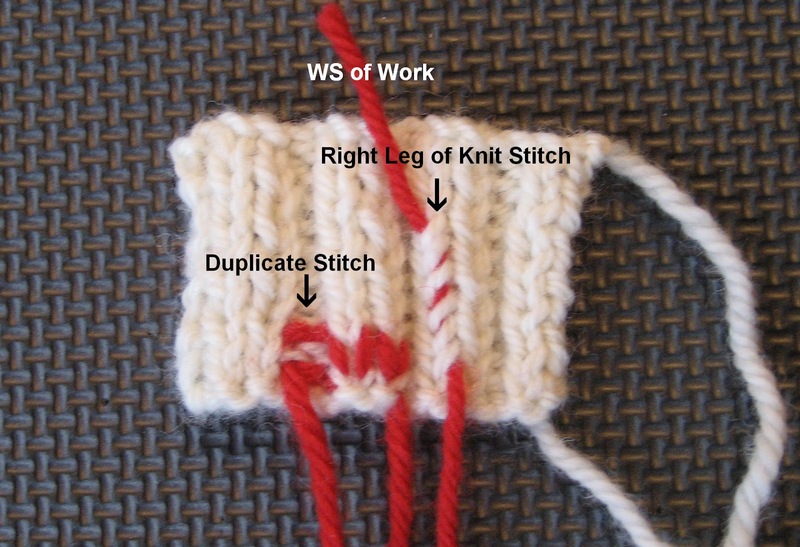 Those of you doing the Masters Program know that we recommend the duplicate stitch method for weaving in yarn tail since it avoids many of the pitfalls of other methods. A yarn tail should not be visible on the RS. 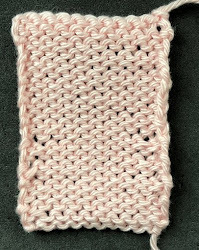 If you weave in the tails diagonally or using the "fish hook" method, you can see the tails. The location where the yarn tails is woven in should have the same elasticity as the surrounding fabric. This is the one that rules out most other methods. If the fabric doesn't stretch the same, it is easier for the yarn tail to pull free (and generally work its way to the RS). 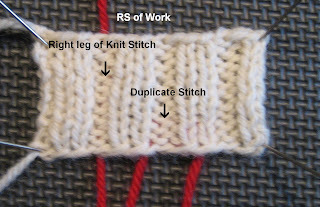 You can use the duplicate stitch method for ribbing but it does make the fabric a little thicker and it can make the ribbing a little less ribbed. 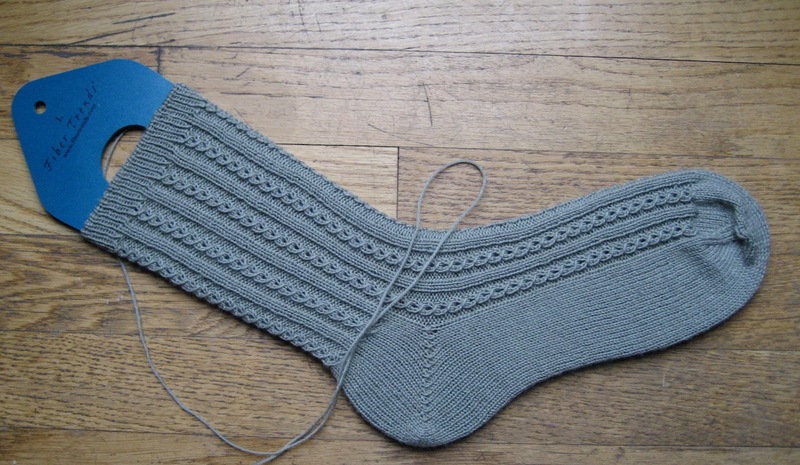 For projects like a sweater, you can always run the tail up the seam but for socks and other projects that won't be seamed, it can be a problem. Running the tail up one side of a knit column works just fine. In the photo I have woven in some red yarn using the duplicate stitch method as well and you can see it does enlarge the ribbing section. I have been using this method on all of the socks I have knit over the years and I have yet to see a yarn tail work its way out. Salon this week will be on Sunday since there is a home basketball game at 4pm. I should still have some of the candy from Goumas Confections. Their dark chocolate toffee is absolutely wonderful. They have a new salted caramels which I got as well. By the way, the opera last week was wonderful. I always cry when Brunnhilde throws herself on Siegfried's funeral pyre. Now that is opera! There will not be a Salon next week since I will be at Stitches. I did manage to finish up everything for the photo shoot with time to spare. I now have time to knit for myself (or rather catch up on presents!) The next selection meeting for Cast On is in early March so I should be able to catch up. Since the editors at Cast On signed off on my series of season designs inspired by Utah and RedFish Dyeworks yarn, I have to have a pretty good idea of what I want to do by the time I get to Stitches. RedFish will have a booth. I have finalized the silhouette for the garment. It will be an open jacket with a broad band picked up along the front. I have been going through my Fair Isle and Scandinavian books for inspiration and I will start graphing today. The body of the sweater and sleeves will have the same motif worked in different colors (like the Autumn on Routes 12 and 24) but the broad band will have a different one (maybe). I always like to include a design element for the next season (Summer) and as a tribute to my husband's passion for fly fishing, it will be a fish. I am really looking forward to seeing Elff & Sandy to select the colors. I plan to stop by and see Miss Babs as well. I think she'll be pleased by the tunic photos. I like a challenge and since these boys live in Oregon and are very much outdoor kids I plan to make snowboarding hats. The hats will be four different colors with I-cord dreads using all of the colors. Penny (editor at Cast On) liked the idea so maybe we will do them for next winter. The other hats were in Cast On last year. Another one of my New Year's Resolutions is to use stash yarn. I will use this yarn for the hats. Since my husband is visiting his friend in early March, I do have a deadline. No problem.